air krete® insulation being installed in an older house. 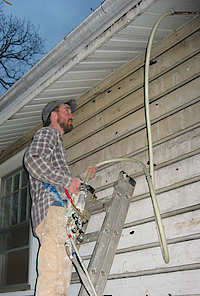 Please Note: WNC Energy is no longer installing Airkrete or any other insulation in the Asheville and surrounding area. Please try contacting the parent company at 315-834-6609 for the nearest Airkrete installer. WNC Energy was originally conceived to develop innovative techniques in green building and alternative energy fields. We started with an insulation business that promoted and provided solutions to the future energy challenges we face. Our next efforts were directed at an aerated concrete wall / building system, but funding and the housing market/economy became insurmountable obstacles. Hence we decided to fold our operations and this website remains as an educational tool only now. Our chosen method of helping people save money and energy was through the conversion of current buildings, especially older homes, to greater energy efficiency through deep green methods and products. Increased energy efficiency coupled with cutting-edge means of energy production will accelerate our nation's journey to reliable and clean energy sourcing. Our goal, inherent in our name, was to conserve energy at this crucial crossroads. Our focus was on improving existing structures, and our primary tool was installing air krete® insulation. WNC Energy was for a time, the only licensed, factory trained installer of air krete insulation in North Carolina. Air krete® is the greenest and healthiest insulation with one of the lowest carbon footprints on the market today. This non-toxic cementious foam is petroleum-free and is ideal for older homes, remodels, historical restorations and other retrofit applications. Please click the air krete® logo below to read more about the product.